Inspiration is everywhere and books are a great way to get inspired. Whether they be of the motivational genre, autobiographical or some good ol' fashioned fiction, it's amazing what a good read can do for the mindset. My summer reading list are all books I was given for Christmas. My family and friends know me so well! (1) Motivational: "Girl Wash Your Face" by Rachel Hollis is a New York Times bestseller and documents the journey of Rachel as she ventured down the path of her own self awareness. Hearing other people's stories and how they overcome their own self talk and personal doubt, is a great way to explore our own inner monologue and the self-created barriers we put up at the detriment of our positive forward movement. (2) Autobiographical: I don't read biographies but I do love a good autobiography "straight from the horse's mouth". Especially those written by people who have pushed hard to achieve their dreams showing us that rarely is success of the overnight variety. Listening to Olivia Newton John talk about her more recent challenges with her health and hearing the positivity through the adversity is enlightening. 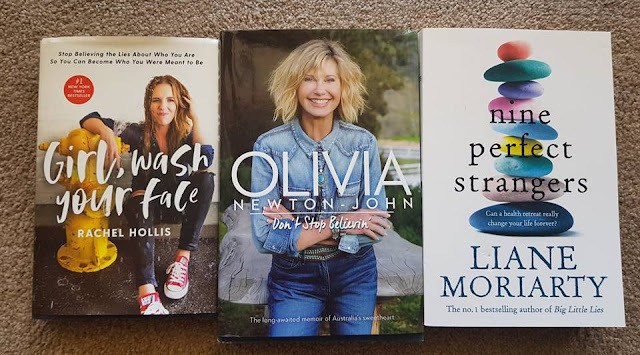 (3) Fiction: Sometimes in fiction there are hidden gems, like Liane Moriarty's "Nine Perfect Strangers" which documents the nine different stories of people who are thrown together at a health and wellness retreat. Shame, guilt, loss, grief, privilege, insecurity, addiction, identity and love all come together in this melting pot exploring a deep connection of nine people as they strive for total transformation. It's quite thought provoking in looking at our own mental well being. What type of books inspire you? This post is part of the Inspiration series I'll be rolling out over the next 18 months as I celebrate 50. So not like you in this regard. Memoirs are a delight for me., I listen more than reading. Currently listening to Michelle Obama reading Becoming and reading an actual book Say Hello by Carly Findlay the blogger. I do have one fiction on audible in the car and that is Bridge of Clay by Aussie author Markus Zusak. Loved listening to The Lost Flowers of Alice Heart and Eleanor Oliphant Is Completely Fine - both fiction. I think I will add Olivia's book to my list. Denyse x PS the linky and I played NICE today! I don't read biographies at all - but am straying into some memoir for a change. I'm reading Jay Rayner's Ten (Food) Commandments at the moment - as research for my new novel - which I'm laughing out loud at. I do love his writing and have been following him and Grace Dent in the Guardian/Observer for years. I'm also reading a Cotswolds Way memoir that is seriously better than a sleeping pill. I'm in a suspense fiction phase at the moment. I did deviate for a bit with Liane Moriarty's 'Nine Perfect Strangers' though. All my current reads do have that element of escapism in them though as a common theme. These all look good to me! I'm currently reading a novel called "Henry the Queen's Corgi" for something light and fun. I love reading biographies and memoirs. I like non-fiction over fiction. Thanks for hosting and I hope that you have a wonderful weekend. Oh Olivia has always been our favourite girl, we saw an interview on her ranch with her husband recently. I must get her book. I read autobiographies, they are like delving into someone else's life. These sound like 3 great books. Motivation is discovering something that energizes you. I've never experienced difficulty discovering motivation for new tunes, regardless of what I'm doing. We are an online interface where understudies check and make reviews for Statistics Assignments related destinations.